Anmon falls is part of Shirakami Sanchi, a World Heritage beech forest located in western Aomori Prefecture. The 3-tiered waterfall is well worth a visit if you’re looking for a quick half-day escape from the crowds in nearby Hirosaki city. The hike: From the bus stop, the trailhead is a bit tricky to find. Walk out to the main road and turn left, crossing the metal bridge that spans the river. Just after crossing, you’ll see signs pointing the way to 暗門の滝歩道 (Anmon no taki hodou) Turn right and follow the asphalt past a toilet and a concrete dam to the start of the trail. There’s a water source here, so fill up your water for the walk. You’ll see a trail leading into the forest directly to the left of the water source. Ignore this trail, as you’ll use it to complete your hike. Follow the concrete trail along the river instead, which will lead directly to the waterfalls. The initial part of the path climbs past a concrete dam, but don’t fret: the rest of the way, though on a concrete trail most of the time, follows a natural river. The route is incredibly easy to follow but can be incredibly slippery in wet weather, so use extra caution in the areas with metal staircases and wooden planks. The trail has been washed out in several places, so boardwalks have been installed, which make the area look like one big construction zone in parts. After a couple of minutes, you’ll cross the river a couple of times and see a junction with a trail leading off to the left. Ignore this trail for the time being and head to the right, following the sign reading 暗門の滝へ. The path alternates between the left and right banks of the river, with some areas that can become real traffic jams if hiking on the weekend. Follow the 順路 signs as much as you can, as they can help alleviate some of the tight spots. After about 40 minutes or so, you’ll reach the first of the 3 waterfalls. When you reach the junction, turn left and descend to the base of the falls (the sign says 第3の滝はこちら). The first fall makes a great place to take your first break and soak up the scenery. Once satisfied, retrace your steps and continue climbing towards the remaining two waterfalls. The path actually climbs up to the left and over the first fall before ascending to the second fall, which should take about 10 minutes or so. Just before reaching the second fall you’ll see a trail branching off on the left that climbs to a small shrine. The shrine itself isn’t much to look at but it might be worth a visit to pray to the mountain kami for good weather. Between the second and first falls you’ll pass through a tunnel burrowed into the rock before reaching the final fall and the end of the trail. After sufficient photography time, retrace your steps all the way back to that first junction. At the junction, instead of turning left to cross the river, head straight on the trail marked 散策道へ. The trail climbs into a wonderful virgin beech forest, which, unfortunately, has been victim to people scrawling graffiti in the bark of some of the trees. Regardless, it’s still a nice place for a stroll and a great way to end the hike. The route is very well-marked and about halfway on you’ll see a junction on your right that follows a small stream. Take this trail as it meanders through the forest. Eventually it’ll meet back up with the main trail. When it does, take a right and continue towards the start of the trail. A short while later, you’ll see another trail branching off to the right. This loop is shorter and somewhat diminished by the cedar trees planted along the route! You can take this trail if you’d like, or simply ignore it and continue on the trail back to the parking lot. At the parking lot you’ll find a restaurant, as well as a hot spring bath. Both make a great place to kill some time if you find yourself with extra time before the next bus. When to go: This hike can be done between early July and early November, when the buses to the trailhead are running. If you have your own transport, then you can consider going a little earlier in the season. Just confirm that the road is open before you go, as the road is closed in the winter. Access: From bus stop #6 at Hirosaki (弘前) station, take a bus bound for Tsugaru touge (津軽峠) and get off at Aqua Green Village Anmon (アクアグリーンビレッジANMON) bus stop. The buses only run from July 1 to November 4, and there are only two buses per day for the 70 minute journey to the trailhead. Click here for the bus schedule. The tourist information centers at both Aomori and Hirosaki stations have a flyer with the bus schedule and a simple map. Pick it up before getting on the bus, as it has the return bus times as well. Mention Mt. Ōe to any Japanese person, and they’ll likely start indulging you in the legends of the many oni (demons) that roam the ridges of the hallowed peak. Despite the less than stellar image, a traverse along the entire mountain range in good weather is one of the best hikes in Kansai for panoramic views. The hike: There’s a water source at the shrine so fill up your bottles before setting out and take a couple of minutes to admire the wonderful view of the valley below. The trail starts just to the left of this water fountain (on the right side of the road), but if you look across the road you’ll see a trail marked for the Oni’s cave (鬼の洞窟). You could consider taking this 10-minute detour to check out the cave (I didn’t have time when I went so I’d be curious to know what’s down there). Anyway, take the trail marked for Senjogatake (千丈ヶ嶽) which meanders through a beautiful forest on a series of wooden steps built into the hillside. It’s a steep climb at first but the grade flattens out a bit as you approach the ridge. After about 15-minutes you’ll reach a trail junction where you’ll turn right for the final climb up to the first of three summits. Shortly before the junction you’ll see a clearing on your left that has good views of the surrounding mountains. Continue the gentle ascent for another 10 minutes until arriving on a broad summit plateau. This is the official high point of Mt. Ōe, so pat yourself on the back and take a few minutes to take in the superb scenery. On a clear day you can see every mountain in Kyoto Prefecture as well as most of the peaks of Hyogo Prefecture. If the cloud is in (as it often is) then you’ll just have to use your imagination. The trail continues on the far side of the summit, so walk past the tall signpost and drop into the forest to the northwest. You’ll soon see signposts indicating a 500 meter horizontal distance to Hatogamine (鳩ヶ峰). Once you bottom out it’s a short but somewhat steep climb above the trees again to the top of the second peak, where there are even better panoramic views. This time you’ll be able to see the Sea of Japan and also see a mountain in front of your that resembles an inverted cooking pot. This is the final peak in the Ōe trilogy, aptly named Nabezuka (鍋塚 – Nabe pot mound). It’ll take about an hour to reach the summit of that mountain, so continue traversing along the trail directly in front of you. Again you’ll drop back down into the forest and descend to a saddle, where you’ll find a parking lot and toilet. This is an escape route if you don’t have the time or energy for the final peak. All you need to do is follow the forest road back down into the valley and you’ll arrive at the bus stop. Otherwise, continue on the trail just above the parking lot. It’s a long, gentle climb with views that open up the higher you go. After about 15 minutes you’ll reach a junction with a path shooting off to the right. The signpost is hand-written and hard to read, but this is the trail you want to take on the way down after visiting the summit of Nabezuka. It’s 500 horizontal meters to the top and it should take you about 10 minutes to reach it. There are a couple of benches you can use to take a rest and admire the scenery. Once satisfied, retrace your steps back to the junction and turn left, dropping through an area of ankle-turning rocks before reaching a forest road with a signpost that says Oeyama Green Lodge 3.5km. Turn left and walk on the flat gravel road, following the signs to the lodge as you wind your way though an area with blue netting set up to keep the deer from eating the tree bark. At the end of the road the trail will fork to the left, so follow the steep switchbacks for about 20 minutes until reaching a paved road. Walk down the road and turn left when you see the signpost that reads Viewpoint of the Senjougataki 150m. If you have extra time you could walk that extra 150 meters to see the waterfall, but keep the (limited) bus times in mind. From here it’s about a brisk 10-minute walk to the bus stop. Turn left when the road merges with the main road (there are a couple of colorful Oni statues here). The bus stop is just down from the entrance to the Oni museum, which makes for a great place to kill time if you’re stuck waiting for the 6:10pm bus. When to go: This hike is best done from mid-April to late November, when the trails are clear from snow. The peak is also popular for snowshoeing from the ski resort, but you will need a lot of stamina and time to traverse all the way over to the high point. Access: Although best approached by car, relying on public transport, though inconvenient, allows you a chance to traverse the entire ridge without having to retrace your steps back to the car. From either Osaka or Kyoto, take a JR train to Fukuchiyama (福知山) station and change to a local train bound for Miyazu (宮津) on the Kita Kinki Tango Railway (北近畿タンゴ鉄道). Get off at Ōeyamaguchi-Naiku (大江山口内宮) station. The railway platform is actually inside of the JR station, so go downstairs and then up to the second floor and buy a separate ticket there. It costs 380 yen one-way from Fukuchiyama station. You might find it faster to take a limited express JR train to Fukuchiyama if you don’t want to leave at the crack of dawn. The first limited express train leaves Kyoto at 9:25am (9:10am from Osaka) on weekends, which allows you plenty of time to connect to the 11:07am train bound for Miyazu. That’ll get you to Ōeyamaguchi-Naiku at 11:36am. Go out the exit, down the stairs, and turn left on the main road when you get outside. Walk 100 meters down the road to the Tourist Information Center, marked by the colorful oni statue outside. The staff there will call a taxi for you (tell them you want to go to Oni-take Inari Jinja (鬼岳稲荷神社). The local taxi company is now bankrupt, so you’ll need to wait about 30 minutes for the taxi to come from Fukuchiyama to fetch you. 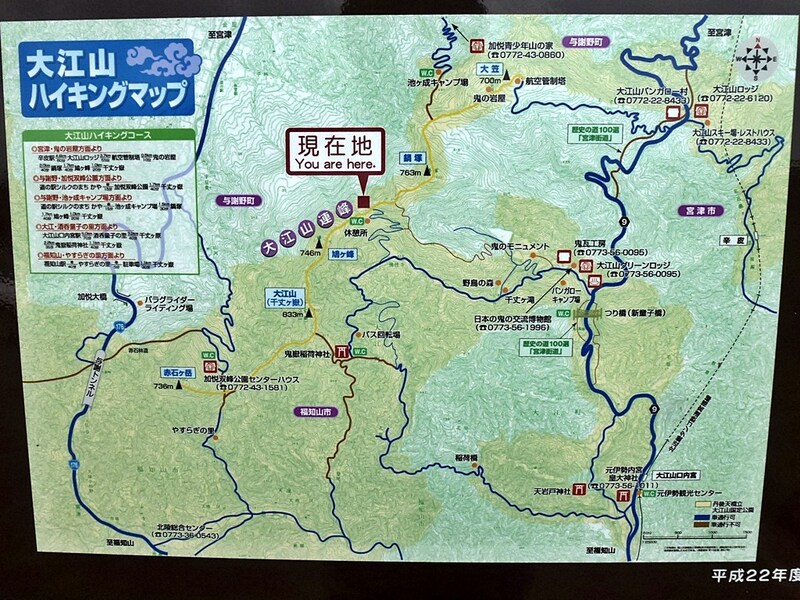 The taxi will cost about 2500 yen for the 15-minute journey to the trailhead. From the end of the hike at Ōeyama-no-ie, there is a cheap bus back to Ōe station, where you can take the train back to Fukuchiyama and transfer back to a JR train for Kyoto or Osaka. There are only 2 buses in the afternoon, so aim for the 3:50pm bus if you’re a fast hiker or the more leisurely 6:10pm bus. There’s a great museum at the bus stop dedicated to the Oni culture if you’ve got extra time to kill before the bus. The bus, if you can call it that, is nothing more than a minivan that seats 7 people. It only costs 200 yen to ride and the driver is friendly. Click here for the bus schedule.